Clear View Retractable Screen™ Systems are the leading solution for creating insect free natural ventilation for the home that works on almost any style of swinging or sliding doors. They are there when you need them and stow away out of sight when you don't. Although the Retractable Screen concept is not new, most people have never heard of or seen a Retractable Screen. Clear View has reinvented the concept of the retractable screen making it safer, more functional & versatile, while pleasing to the eye. All Clear View Retractable Screen™ Systems are "Pet Friendly" and made in the USA. For additional information on all of the products that we carry, please give us a call at (866)795-1611. Patented Speed Reducer .......Our Patented Speed Reducer slows the screen’s return, preventing it from slamming and potentially injuring the unwary user. Clear View™ puts your safety first. By eliminating the slam back common to other screens, Clear View™ has taken the Retractable Screen to the next level. 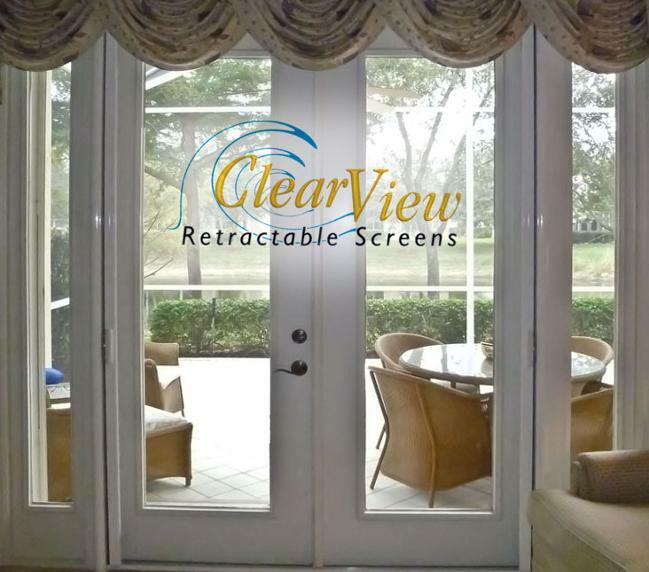 Patented Hidden Magnet System........The Clear View Retractable Screen™ System includes a Patented Hidden Magnet System. This Hidden Magnet is encased within the pullbar.....Out of Sight, Out of Mind. Retracts When Not In Use....... When not in use the Screen will stow away out of sight, safe and secure. Clear View Retractable Screens™ utilize the old-fashioned technology of roll-up blinds, updated and advanced to work vertically or horizontally. Our screens are manufactured with a durable, light weight aluminum housing that protects the screen when not in use. Within the housing, the Clear View Retractable Screen™ is anchored to an aluminum tube and tension control device. Clear View's Patented Speed Reducer insures our doors will retract fully without danger of trapped fingers or a "slamming" return. Powder Coating.........Clear View Retractable Screens™ feature a Powder Coated finish formulated to exceed the toughest paint standards in the industry for UV and salt spray resistance. Super Screen Available in Black .......Super Screen™ is 3 times stronger than traditional fiberglass mesh.